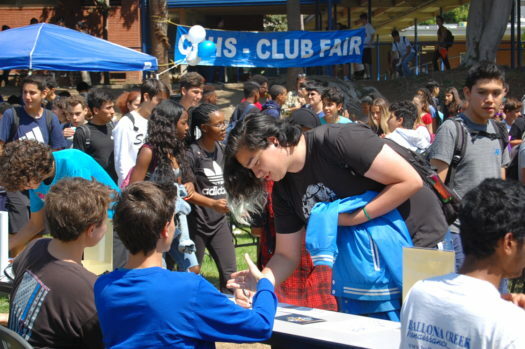 On Wednesday, September 12, Culver City High School held its yearly club fair to show off its amazing clubs and the students so very passionate about them. There were a total of 86 clubs that turned out for this year’s fair according to our Assistant Principal Kelli Tarvyd. The variety of clubs that were shown off at this year’s club fair included: Tolerance Club, Black Student Union, Robotics, and Ballona Creek Renaissance to list a few. There were also a few new clubs such as the freshmen run Flat Earth Society that was the buzz of the event by having recurring crowds during the fair! Of course, this year’s club fair couldn’t have happened without help from ASB’s dedicated Commissioners of Activities: Merha Mehzun and Claribel Alcantar, as well as many other ASB members. Thanks to everyone’s help, the clubs at our school were given a voice and an opportunity to show off their achievements and purpose with passion. The commissioners even claimed they were so happy with the way that everything turned out. Such an exciting event continues to have us on the edge of our seat to see what our clubs will have in store for us next club fair!